Today, we’re switching things up. 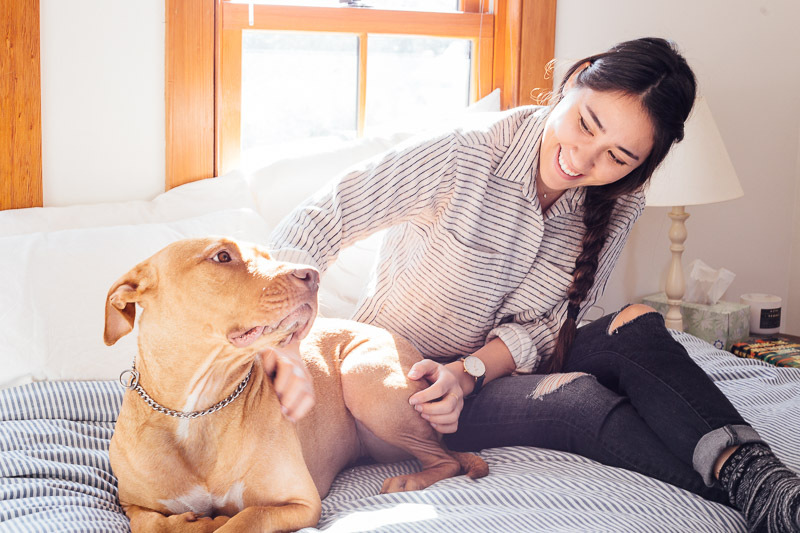 Our resident blogger, Joy, is here to share her personal experience raising and owning a pit bull, and what advice she gives anyone wanting to bring one home themselves. A few weeks after my 23rd birthday, I adopted my pit bull mix, Juniper. She was six months old, with a white patch on her chest and paws the size of my palms. I remember showing her around the house (here’s your water bowl, this is where you’ll sleep, here are some toys) and feeling a little nervous, like I was showing a new friend my room. She was hesitant and shy, and it quickly became clear to me that she hadn’t seen much more than the inside of her crate. On our first walk, she stopped to stare, mesmerized, at a lamp post. I will never forget. The women who worked at the shelter warned me, kindly, that not everyone would be okay with her breed, that I would be presented with awkward, unpleasant situations because she was a pit bull. I said okay. How bad could it be? What the volunteers at the shelter didn’t tell me is that owning a pit bull would throw me into many, many difficult and unsettling situations, that by choosing her, I was choosing the world’s most hated dog – an immense responsibility. Men have scooped up their toddlers when they see us coming. Dog owners have picked up their small poodle mixes. I have become so accustomed to these responses that I often don’t notice them anymore, but it has taken me awhile to get this place – to a place where it doesn’t infuriate me, or fill me with sadness. Whenever someone asks if they should get a pit bull, I tell them this: they are the sweetest, most loyal, thoughtful, and expressive dogs. I can’t imagine my life without Juniper – the way her tail wags when I play Norah Jones, or how she is so, so gentle with puppies. But I also tell them this: when you bring home a dog with so much stigma, you are bringing home a world of hate. It is the owner’s responsibility to make sure the dog is safe, well-trained, and thoroughly exercised. I stand up for Juniper because I have spent the time and energy to train her. For every person who crosses the street when they see her, is a person who stops to promptly fall in love with her. Yes, pit bulls have big jaws. They also have the biggest hearts.